Spain is taking part since 1961 in the Eurovision Song Contest with “Estando Contigo” by Conchita Bautista and came 9th. There were two winning entries in the history of Spain in the ESC: “La La La” by Massiel in 1968 and one year later “Vivo Cantando” by Salomé. Over the years Spain was quite successful and presented great and unforgettable songs like “Eres Tú” by Mocedades in 1973 (2nd) or “Vuelve Conmigo” by Anabel Conde in 1995 (2nd). Due to many changes in recent years, Spain did not benefit from the instaurations, and Spain was often found on the lower side of the scoreboard. Spain is automatically qualified for the Final every year and does not have to qualify in the Semi Finals. The reason for ending up so badly is probably that the quality of the Spanish songs was not as high as in former years, that’s unusual if you think of the big Spanish music industry with plenty of good artists. Eurovision has lost popularity, if Spain also had to qualify for the Final; there would probably more effort in choosing the right song for Eurovision. There has been a Spanish pre decision on TVE as always and the quality of the ten songs was quite high. Former Spanish singers like Rosa and Sergio Dalma also joined that exciting evening. 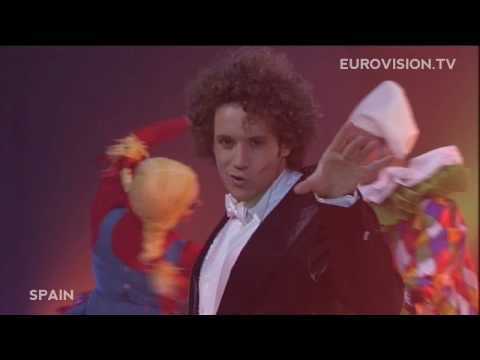 The televoters and juries decided for Daniel Diges singing “Algo pequeñito “(“Something little”), an unusual and unconventional song. The folkloristic influences are blended in a cleverly way with memories of “Fairytale”. After five years of desolation Spain comes back with class. This song could also be of another decade, a timeless dramatic ballad. Good choice.